Recently I read Tricked (Fairy Tale Reform School) by Jen Calonita. 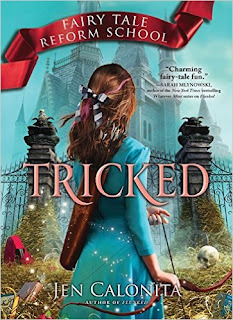 Tricked is book three in the entertaining Fairy Tale Reform School series. With the surge of books making plays on traditional fairy tales, it is fun to read a unique spin. Fairy Tale Reform School focuses on sending those young people who are on the road to trouble to a special school run by reformed villains (such as Cinderella’s evil stepmother). The books combine the classic fairy tale characters and introduce new characters and plots. Tricked centers on Gilly’s desire to return to FTRS to find out what sneaky trick the new headmaster, Rumplestiltskin is planning and to help her younger sister, Anna, who has been sent to FTRS along with her closest rebellious friends, Hansel and Gretel. All Gilly knows is that her sister is not acting like herself and the town is enchanted with Rumplestilskin’s desire to “Make Enchantasia great again.” Gilly reunites with her fellow former FTRS friends to get into enough trouble to get thrown back in. The novel follows this wise, crafty, bad-turned-good band’s quest to save their beloved school, home and families from Rumplestilskin. My only regret with this book is that I wish I had read the previous books in the series. The book does not stand alone, and I would have understood more about the characters and the setting if I was familiar with the previous books. Fans of the series, rejoice! Tricked will be released in March.